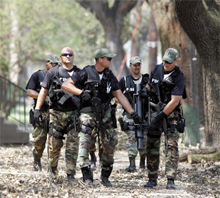 An FBI SWAT team assists local law enforcement in New Orleans in the days after Hurricane Katrina made landfall in August 2005. The storm disrupted government functions of all kinds, including law enforcement. Both civilians and law enforcement personnel exhibited lawless behavior, with the result that citizens lost significant day-to-day freedom. In a most unfortunate example of the Paradox of Structure, removal of structure led to loss of freedom. Photo courtesy U.S. Federal Bureau of Investigation. The paradox of structure is that structures, of whatever kind, simultaneously enable and limit human activity. The paradox has long been recognized in the field of education. For example, at one time, decades ago, it was thought that playground fences inhibited children's creative play. But in fenceless playgrounds, it was found that students felt insecure, playing less creatively. They remained clumped in the center of the playground, afraid to use its open expanse. When the fences returned, the students expanded their play to use all of the playground space. The limiting structure of the fences paradoxically enabled a sense of freedom. Because of the Paradox of Structure, removing or imposing structures can have surprising, unintended effects. At work, although we might expect structure removal to further organizational goals by enhancing productivity or creativity, it doesn't always do so. And imposing new structures doesn't always limit behavior in the ways we hope it will. Consider workplace bullying. Targets of bullies typically assume that they can end their misery — or at least minimize it — by adjusting their own behavior. They hope that if they avoid or take care not to offend the bully, the bully will leave them alone. This hope is based on social structures built around one of the customs of decorum that most of us honor: courtesy begets courtesy, and offense can beget counter-offense. Such a relaxed social structure enables most of us to interact smoothly with each other, more or less. The structure enables our fair treatment of each other. But it also limits our fair treatment of each other. Here's how. Most bullies don't bully to exact revenge on their targets for supposed past offenses. Bullying behavior is pathological, and the pathology lies within the bully. Bullies might use some prior act of the target to justify their abusive behavior, but they are merely exploiting, as a defense, the reciprocal-courtesy social structure in which we all work together. enable bullying to thrivebullying in the workplace persists because the workplace social structure is weak enough to enable bullying to thrive. Probably out of respect for personal freedom, many workplace social structures tend not to impose constraints on personal behavior that are as tight as the constraints that address work processes. By avoiding constraints on personal behavior, workplace social structures leave room for bullies to maneuver. In the end, because bullying persists, relaxed workplace social structures create tighter constraints on people overall than would a more stringent regime that severely limited bullying behavior. Now emerging is a consensus that we can reduce the incidence of workplace bullying only by tightening constraints on personal behavior. Would you like to see your comments posted here? rbrenzikGsuhYWBETZOeLner@ChacCuSkzJurBvJLYHRPoCanyon.comSend me your comments by email, or by Web form. See also Workplace Bullying and Problem Solving and Creativity for more related articles. I offer email and telephone coaching at both corporate and individual rates. Contact Rick for details at rbrenzdGDkADpVVmHbzsLner@ChacSLkyBrfGDbPxfLNcoCanyon.com or (650) 787-6475, or toll-free in the continental US at (866) 378-5470.